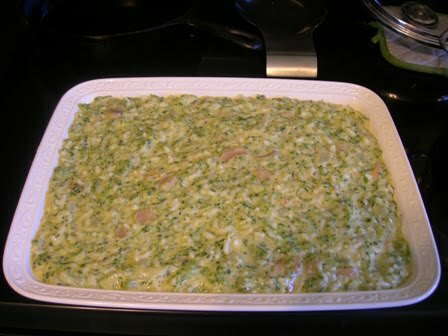 This morning I made this Broccoli Rice Casserole to take to our church’s 5th Sunday covered dish luncheon. This is an old, old recipe that has been around forever, but I thought I’d share it with you in case you’ve forgotten about it. 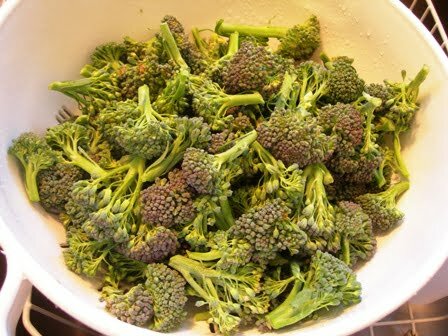 I used the last of the fresh broccoli from our garden, but you can use a package of frozen broccoli. Here’s mine all cooked and chopped, but if you’re using frozen broccoli, just thaw it. You will need 2 cups of cooked white rice. 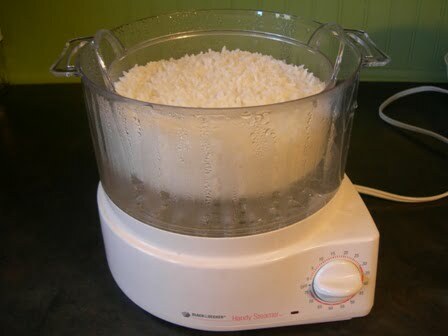 I always cook my rice in this steamer, and it turns out perfectly. 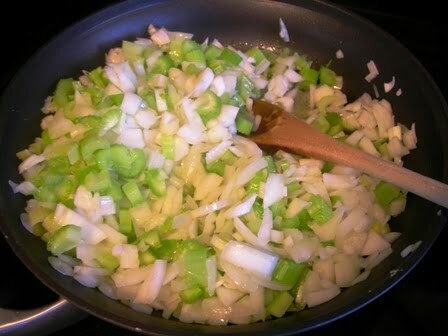 While the rice is cooking, saute 1/2 cup each of onion and celery in butter. 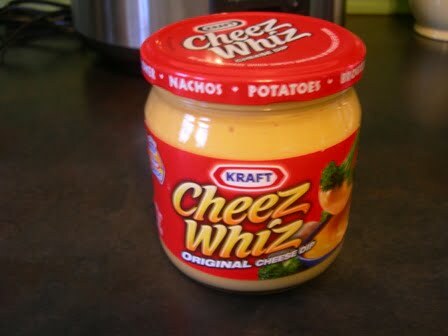 Here is the ingredient that makes this casserole-Cheez Whiz! I used the 15 ounce size because I like the casserole to be nice and cheesy. Put the Cheez Whiz in a large bowl along with a can of cream of mushroom soup, 1 can of chopped mushrooms, and 1/2 cup water. 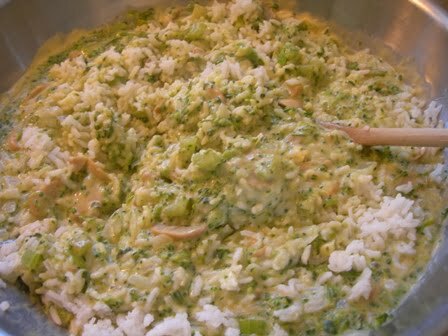 Mix it all together and then add the celery, onions, rice, and broccoli. Combine everything together and pour into a greased 2 quart casserole dish. Bake at 350 degrees for 50 minutes. The casserole disappeared quickly at our church luncheon today! And if you haven’t entered our $50 Pottery Barn giveaway, click HERE. The winner will be announced Feb. 1! Love this casserole. Make it every Christmas. My recipe is so old, it says use a 39¢ Jar of Cheese Whiz which is the small jar … does that tell you how long I have been making this? Yum!! I love casseroles. I need to add this to my to do list. It’s been years since I had this! It looks yummy! That sounds delicious and sooo perfect for this time of year! Visiting from the Cozy Home Party. Have a good week! Sounds so yummy! I am going to make that. I’ll bet it is a success at the Church Dinners…. No wonder your casserole disappeared so quickly, it looks so delicious!..Thanks for the recipe! Have a wonderful day! I have made this casserole several times lately. 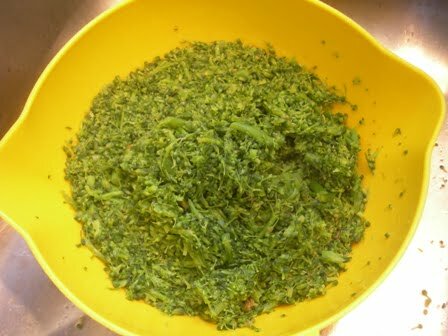 We have had a bumper crop of broccoli this year! Glad that you posted this, I haven’t made it in such a long time! My daughter loved it when she was little! Thanks for the reminder!! A family friend serves this every year at our annual Christmas party. It’s always a hit. Thanks for sharing the recipe. I really love this one, but I haven’t had in a really long time. My family loves this dish. We had it for every special occasion when I was growing up. I confess I haven’t made it in years. Putting Cheese Whiz on the grocery list! Looks so yummy and you are getting so creative with the clickable, printable version. 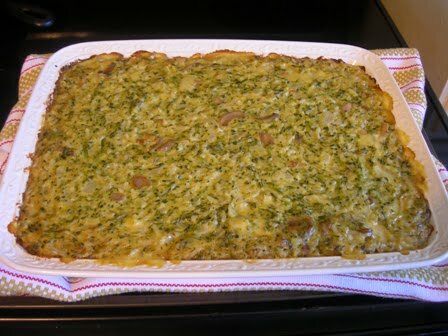 One of our favortie Christmas dishes is my Mom’s broccoli casserole. It does not have rice, so I guess I will have to try it! 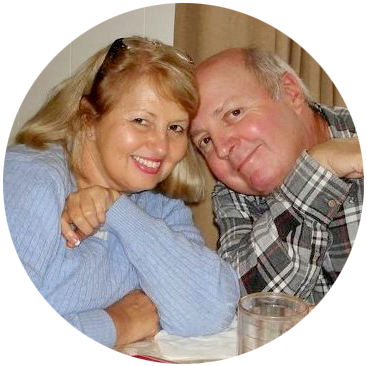 This looks really good and can serve a crowd… I also enjoy making casseroles in advance and then I get to spend more time with my family when they visit!! I will have to try this one!